DART will have a major service change on Sunday, August 19, which will impact this, and every DART route. Learn more. Operates between the Gloria Dei Lutheran Church Park & Ride and Buccaneer Arena Park & Ride. This service will operate on a specific route and schedule with dedicated stops along the route. Customers are able to board at any stop along the scheduled route for $1.75. 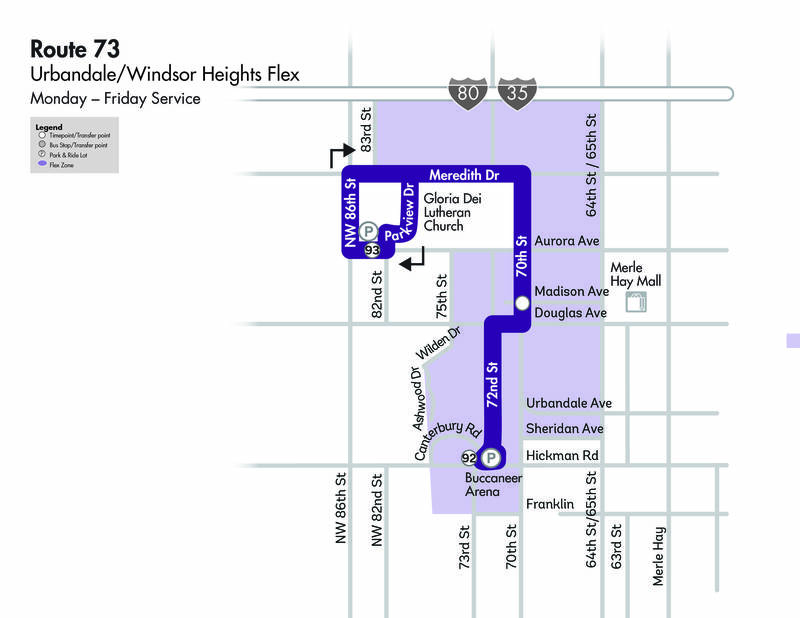 This route will also operate as a limited flex service between scheduled stops, and will deviate within the Flex Zone for $3.50. Customers may request a flex trip, up to seven days in advance, by calling 515-283-8136 during DART service hours. Flex trip requests upon boarding may be accomodated when time and space is available. To cancel or change your flex trip reservation, call 515-283-8136 during DART service hours and at least 30 minutes prior to the scheduled pick-up, or a no-show will be recorded. More than four no-shows in a calendar month may result in a suspension of your Flex service. Flex service trips are available on a first-come, first-served basis and are limited to trips that ensure the service is reliable for all customers. You may be asked to get on or off the bus at a location that is within a few blocks of your origin or destination. Some locations are not accessible to DART buses. Connections: Express Route 93 at Aurora Avenue and NW 86th Street. Express Route 92 at Buccaneer Arena at Hickman Avenue and 72nd Street. Guaranteed Ride Home: In case of an emergency, DART will guarantee a ride home to individuals riding Route 73, between the hours of 8 a.m. and 3:30 p.m., Monday through Friday. To qualify for a Guaranteed Ride Home, you must be a monthly bus pass holder, Unlimited Access participant or RideShare vanpooler. For full program details, click here. Important Note: The turn-by-turn instructions only describe the base route structure and refer only to the direction of travel, when not flexing. The route can flex upon request to specified locations or addresses in the flex zone.